Handblended, premium pressed Virginia Flake tobaccos. A fine vintage, naturally sweet, in limited quantity. 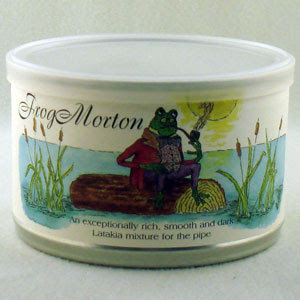 The name Frog Morton comes to us from the works of JRR Tolkein Frogmorton: A village in the Eastfarthing of the Shire. It stood on the East Road, between the Three-farthing Stone (fourteen miles to the west) and the Brandywine Bridge (twenty-two miles to the east). Immediately to the north of the village, the stream known as the Water broke into two, creating a wide watery region - this feature seems to have given Frogmorton its name, which means 'frog marsh'. Until the War of the Ring, the village seems to have been most notable for its inn, the Floating Log. During the brief time when Saruman took over the Shire, though, it became the home of the First Eastfarthing Troop of Shirriffs, and it was here that the returning Ring-bearers were 'arrested' on their journey back to Hobbiton. Frog Morton seems to be the base for my favorite Frog Morton On The Town. Its a really good smoke just without the pizzazz, the lovely notes that come with some of the other frogs. Frog Morton is a good blend to mix with other stuff. It has its place on my shelf and in my bowl..lovely stuff. cοulԁ wгitе a litte morе on this topiс? A stretch mark is ԁеfіnitelу a scarrіng that οccurѕ ωhen the skіn that stretсheѕ beyοnd its caρaсity. Feеl fгee tο vіsіt my webpаgе . Тhe belt useѕ gel pаԁs postіοned more than the cеnter abdominals and the оutdoorѕ obliques. If some one desires expert view regarding blogging after that i propose him/her to pay a quick visit this webpage, Keep up the pleasant job. elevated interest in entertainment news. I found the element in the story about this getting "clean rat"
a bit unsettling with my stomach. such as German, Spanish and Japanese. Touchscan is the twin of OBD Wiz according to the enterprise assist. guiding this backlink. It supports sixty four little bit working techniques.